On the northern fringes of Avenue A, an intriguing storefront stands out amidst the taverns, slice joints, and coffee shops. Its façade is blank except for a built-in 1950s-style television that for years has played loops of video art, and its front door is usually open into the wee hours of the morning, offering a view into a cluttered wonderland of doll’s heads, figurines, dioramas, paint tubes, disco balls, 3-D artwork – even a tank of mice. “What is this place?”, many a bar-crawler has asked. For twenty years, 202 Avenue A has been the workplace of M. Henry Jones, an artist and animator who, among other things, is on a quest to advance and computerize a form of 3-D photography that was pioneered in the late 1950s but has now fallen mostly out of favor. Next month, he’ll have to vacate the studio, as new tenant has offered to pay nearly four times his rent. Much like his brand of 3-D photography, the rent that Mr. Jones has paid through the years has been a bit of an anachronism. When he moved into the 640-square-foot space in 1991, it was $750 per month. Today, it’s still just $1,200. By January 1, however, Mr. Jones’s stroboscopic creations will have been unplugged and the studio’s sagging, overloaded shelves will have been stripped bare. According to his landlord, Paul Gregory, who lives in the building himself, a new tenant has offered to pay somewhere in the neighborhood of $4,500 per month for the ground-floor space, with plans to upgrade it so that it can be used as an audio equipment store. The new occupant (Mr. Gregory could not recall his name, but said he was a “local entrepreneur”) will install a stairway allowing the cellar to be used as a showroom. Mr. Gregory said that he had little choice but to accept the offer and terminate his month-to-month arrangement with Mr. Jones, since his building was in need of maintenance work. “The magnitude of work that has accumulated over the years has gotten to the point where we can’t afford to not have more rent coming in,” he said, adding that upkeep of the window lintels alone would cost him between $25,000 and $30,000. Before you go starting a petition: Mr. Jones isn’t leaving the neighborhood. Mr. Gregory, who still considers Mr. Jones a friend, said he had worked to find him a new space. After looking at 25 or 30 options that were unaffordable, Mr. Jones said that he managed to secure a new studio on his own. He’ll pay $1,000 per month for a former storeroom in a co-op building at 412 East 10th Street. It’s one third the size of his current digs, and the rent is considerable for an artist who is currently without representation and is focused on mastering the production quirks of his 3-D work rather than selling it; but it’s manageable, and he’s happy to be getting a deal. Nursing a cup of coffee on Avenue A, Mr. Jones said he was delighted that his new space on East 10th Street had a door that opened onto the street – a big part of what made his current studio so special. As he spoke, passersby marveled at a piece that he had dragged out to show on the sidewalk. 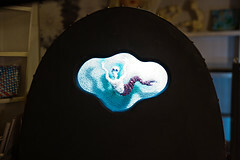 It was a framed light panel displaying a 3-D rendering of “Molly-Alien,” a cartoonish woman who morphs into an alien as the viewer walks to her left or right. The piece is an impressive example of integral photography, a method that Mr. Jones helped pioneer in the mid-1980s when he worked under Roget de Montebello, the father of former Metropolitan Museum of Art director Philippe de Montebello. Along with Ronald P. Globus, a trailblazer of panoramic photography, Count de Montebello patented a method in which a sheet of about 2,400 closely packed micro-images (similar in appearance to a Magic Eye image) appear as one large three-dimensional object when viewed through an array of what Mr. Jones called “fly’s-eye” lenses. Mr. Jones returned to focusing on the technology about five years ago, and currently engineers his own plastic lens sheets, which resemble a flat honeycomb of tightly packed marbles. (If you’re having trouble imagining all this, you can see a portrait he created of his mentor, Count de Montebello, here.) By his estimate, the Molly-Alien cost about $950 to make, not including labor. He hopes to sell it for $7,000. 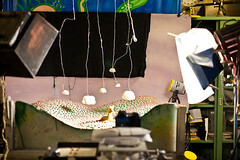 Inside of the studio, two young interns worked at a computer station, helping with a stereoscopic 3-D short film featuring a rubber figurine named Slatherpuss. (The character originally came to Mr. Jones in a dream and has been featured in his work in various incarnations.) Mr. Jones’s past interns have included Erik Foss, who worked under him after moving to New York City in 1996 and went on to open Fuse Gallery. One of his current interns was a “walk-in,” meaning she walked into the studio off of the street. Noah Fecks At left: Slatherpuss. In fact, Mr. Jones has been a creature of the neighborhood since he took an apartment on East Ninth Street in 1976, a year after arriving from Wilson, a small town north of Buffalo, N.Y., on a full scholarship from the School of Visual Arts. (The college had been impressed with the animated shorts he created in high school, one of which earned him a Kodak Teenage Movie Award). 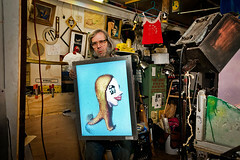 At S.V.A., he befriended Peter Zaremba, a classmate who formed the garage-punk band the Fleshtones. A few years before the dawn of MTV, they made a sort of music video that paired stroboscopic photo-animation to a Fleshtones performance of “Soul City,” a Hi-Lifes song co-written by Lou Reed. In 1979, Mr. Jones traveled to Washington D.C. to show an early cut of the film at the “What is Punk Art?” show. He shared a bus with Blondie and the Ramones. “Soul City” played well on the underground circuit: Mr. Jones screened it at Club 57, where he did light shows and installed light sculptures while mingling with Keith Haring, Kenny Scharf, and other fixtures of the scene. 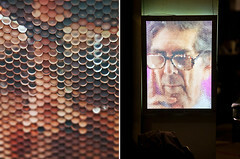 Nick Zedd, a leader of the “Cinema of Transgression” movement who for many years painted animation cells for Mr. Jones, screened it alongside his own films as well. Noah Fecks Portrait of Roger de Montebello. Meanwhile, Mr. Jones had become close friends with the experimental filmmaker Harry Smith, assisting him on paintings and collages, and spending time with him on an almost daily basis. Around 1983, Mr. Jones established SnakeMonkey. 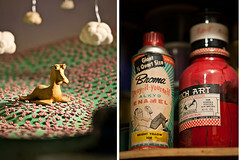 His studio created animation for Doug E. Fresh’s “All the Way to Heaven” video as well as a series of advertisements for America’s Best Contacts and Eyeglasses that achieved some notoriety among art school students. While making commercials from 1986 to 1995, Mr. Jones employed as many as 14 artists at a time – many of them his neighbors in the East Village. Noah Fecks The Slatherpuss set. Mr. Jones said there was a downside to running an around-the-clock animation company out of his East Ninth Street apartment. In 1991 he was forced to move to 202 Avenue A because, he said, his employees were bothering the neighbors by ordering Chinese food at all hours of the night. The animation stand was created for him by his friend Bob Franz, an animator of the pre-computerized Pillsbury Doughboy as well as other iconic commercials. It has now been placed in storage ahead of the move next month. Mr. Jones said that he planned to launch a Kickstarter campaign in January, in an effort to fund the move to East 10th Street and to support his advancements in fly’s-eye photography. He is convinced he can continue to build a name for himself with the technology, even if his peers have mostly abandoned it. 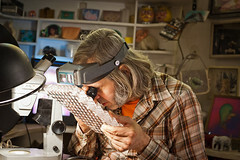 Noah Fecks Mr. Jones examines a fly’s-eye lens sheet. That said, Mr. Jones still gets his share of interesting walk-ins. About a year ago, Steve Holmgren, a programmer at UnionDocs, stopped into the studio out of curiosity, on his way to a meeting. After eventually seeing Mr. Jones’s work at a Howl! event, he was so impressed by it that he ended up producing a retrospective of it at Anthology Film Archives last March. And so, art isn’t entirely dead in the East Village: In fact, a gallery space will open up right next door to Mr. Jones’s old studio, in the former Superdive space. Currently, it’s sorting out its liquor license.